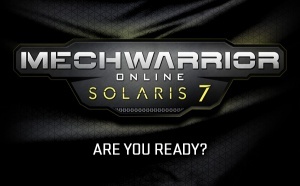 Solaris is a 1v1 and 2v2 arena combat expansion for MechWarrior Online! Drawing from BattleTech lore, the idea behind Solaris fits perfectly for MWO in terms of gladiatorial combat. It features leader boards and a reward structure completely new to MWO and not related to Quick Play or Faction Play. Anyone can participate in the Solaris Games, for both the 1 vs 1 and 2 vs 2 Divisions. This page was last edited on 27 October 2018, at 05:27.